BEVERLY HILLS -- Having landed firmly on his feet in nearly no time, Kevin Reilly resists stepping on the neck of the network that "left my head spinning." The new Fox entertainment president diplomatically says he "would like the best" for the new NBC fall shows he announced in May shortly after signing a new three-year deal with NBC. Then the Peacock astonishingly went behind his back to shoot him down. It was a cold-blooded move even by high-level network TV standards, with Reilly's successor, Ben Silverman, addressing TV critics just six days before Fox began its two-day portion of the ongoing summer "press tour." On Sunday morning, Reilly sat comfortably beside Fox entertainment chairman Peter Liguori, with whom he developed The Shield and Nip/Tuck during their previous teaming at the FX cable network. "I don't have that deep-seated, sort of torn emotion about it," Reilly carefully said of the NBC lineup he'll now be competing against. "If those shows deserve to work, they will." Liguori then swung a sledgehammer. "I will help Kevin with that," he said. "I want them to all be bloody failures." It wasn't the only time Liguori made it clear he didn't like the way NBC had treated his longtime friend. Asked whether his "intimate knowledge" of NBC might help him at Fox, Reilly joked that he'd rather be more familiar with ABC's schedule. Added Liguori in no uncertain terms: "Our sights are not set on the No. 4 network (NBC). Our sights are set on the No. 1 network (Fox) and creating a distance between us and the No. 2 network." He referred to Fox's No. 1 standing with advertiser-craved 18-to-49-year-olds, where it's topped the Nielsens for three consecutive seasons while CBS has remained tops in total viewers. In other words, Reilly has gone from worst to first with network TV's key audience demographic. "I don't want to just sort of paint it with a roller, like everybody walks around with some sort of glazed smile on their face," he said. "But Fox has never been stronger. That has a really positive effect on the people who work there because they created it. I just played through an extreme 'down cycle' at the previous place, which tends to not bring out the best in people during those times." Reilly also noted that joining Fox -- officially on July 9 -- is idyllic compared to the situation he inherited at NBC in 2004. "The good news is I'm not sort of getting behind the wheel here, feeling like the wheels are about to come off . . . I'm going to be pretty low-impact in terms of the on-air stuff." American Idol clearly won't need his help. Despite a slight downturn in the show's overall ratings, it remained a dominant No. 1 in both total viewers and with 18-to-49-year-olds. "I've been a fan of the show literally since minute one," Reilly said. "I voted for people on the show. Everybody involved knows what they're doing. So sure, I oversee it as part of the network. But it's going to be business as usual. There's nothing for me to do." Reilly and Liguori both were tieless and wore jeans. "This is the Sunday Fox look, I'm told," Reilly said. "Weekend Fox." Their friendship is "really not in that Hollywood way where everyone's friends," Reilly said. "It's genuine." "It's like an old love," Liguori later elaborated. "We finish each other's sentences." "Kind of like -- wow," said Reilly. "Maybe that was a bit of a stretch," Liguori rejoined. For the record, both are married with children. But darn it, they really like each other. "He (Liguori) challenges people without getting personal or petty about it," Reilly said after the formal interview session. "And I've learned a lot from him with that style. I had the three best years of my career working with Peter at FX, and I'm looking to re-create that." 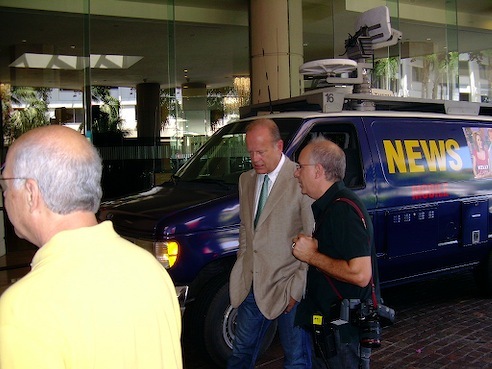 Kelsey Grammer, star of Fox's new Back to You sitcom, talks with a staffer after posing with the show's mock WURG-TV news van. Liguori and Reilly were followed to the stage Sunday by Kelsey Grammer, Patricia Heaton and the fellow stars and producers of Fox's high-powered new Back to You comedy series. It's one of only two new fall sitcoms filmed the old-school way -- with multi cameras in front of a live studio audience. Grammer and Heaton play Pittsburgh TV news anchors Chuck Darling and Kelly Carr. He's rebounded back to Pittsburgh after flopping in several larger TV markets. Co-executive producer Steven Levitan (Frasier, Just Shoot Me!) previously anchored and reported for WKOW-TV in Madison, Wis.
"What's so funny to me about local news is there's this great narcissism pretending to be altruism," Levitan said. "It's just a wonderful place for a larger-than-life character to be a big fish in a small pond." Grammer and Heaton respectively are segueing from two of TV's all-time sitcom hits, Frasier and Everybody Loves Raymond. In very lean times for comedy, they're being perceived by some as possibly the make-or-break saviors of the genre. No comedy came close to making prime-time's top 10 last season, and their numbers have dramatically dwindled in recent years. "No pressure. I have absolute, total confidence," Heaton said. "This is going to be the best new show of the year. I am completely and utterly confident that we will run as long as we want to run." Back to You is being made in a "traditional" form dating back to I Love Lucy. Lately, a majority of new comedies have been "non-traditional" single-camera half-hours such as NBC's acclaimed but ratings-deprived quartet of The Office, My Name is Earl, Scrubs and 30 Rock. All are without laugh tracks or a studio audience's involvement. "If by traditional you mean funny, yes, it's very traditional," Grammer said of Back to You. Co-executive producer Christopher Lloyd, who also worked on Frasier, said that Grammer "plays big attitudes well. And pomposity." "We wanted someone that was obviously not Frasier again," he said. "But not so far away from Frasier that people would say, 'Well, what, he's a sheriff from Alaska?' "
Heaton said she loves "checking out the hairdos" and the overall look of women anchors in different markets. "You've got your local New York anchors -- the gals who really could use a little wax on the brow. Then you get all the way to the West Coast, where some of them look like hookers." Levitan subscribes to the cheeky "News Blues" web newsletter to stay up on the latest anchor gossip. "It's a lot of little minutiae that we're having our writing staff read regularly so that we pick up some of the latest things that happen. So I'm pretty immersed in it." After the interview session, Levitan is convulsed upon hearing that a Milwaukee TV station used to deploy an "Albert the Alleycat" weather and sports puppet voiced by the station manager. For his purposes, that's comedy gold. "I promise you I'm going to steal that," Levitan said.